OCZ really knows how to capture the performance market. OCZ is well known for producing legendary overclocking memory, popular power supplies, performance flash memory products, and even more so for improving such products. Many years ago, the original OCZ Rally USB flash drive gained immense popularity amongst enthusiasts and consumers alike. When the OCZ Rally2 came out a couple years ago, it was even faster than its predecessor -- we've already reviewed the original first revision and were quite impressed by the speed (Although a bit less with its access latency due to UT161 controller problems). From what we can see, we are quite glad that OCZ fixed the latency issues with their flash drives in the past year or so. Recently, OCZ released another dual channel flash drive to the Rally performance flash drive family -- the OCZ Rally2 Turbo. The manufacturer claims that it can hit up to 35MB/s in read performance. How is the turbocharged dual channel Rally2 going to perform? That's something we are really interested to find out. A change from the past -- OCZ switched to UPS from FedEx for shipping. Using a UPS branded box, everything arrived in excellent condition using Ground from OCZ's offices in Sunnyvale, California. The package was well packed and saturated with packing peanuts with bubble wrap around the product package to ensure everything inside arrived in excellent, mint condition for our review today. Our review unit of the OCZ Rally2 Turbo 4GB arrived in retail packaging. The transparent plastic retail package looks like a blister pack upon first glance, but in reality we were excited to see that the edges were not bound together. A quick snap around the bound edges disconnects the clamshell and permits easy opening. OCZ took a different approach to its design scheme with the Rally2 Turbo -- the orange and white design is now replaced by a dark color scheme consisting primarily of black, gray, and a hint of orange. The model name is printed across the top with the capacity located at the top right corner. Feature highlights are printed on both sides with the Rally2 Turbo flash drive placed in the middle at an angle. A speedometer is printed in the background to create a sense of speed associated with the OCZ Rally2 Turbo flash drive. The other side of the retail package backing insert retains the same color scheme as the front with extended feature and performance highlights of the OCZ Rally2 Turbo. Sliding the contents out of the retail plastic pack, you will receive the OCZ Rally2 Turbo itself, a really long white lanyard wrapped in plastic packaging, and a USB extension cable -- as tradition goes; because our previous OCZ Rally2 flash drive came with an extension cable as well. It's quite convenient sometimes as I've found it quite useful on more than a couple of occasions. Again, the drive reviewed in our article today is the 4GB variant, but an 8GB OCZ Rally2 Turbo is available for purchase as well. The OCZ Rally2 Turbo is a long yet sleek flash drive with black aluminum casing; retaining much of the design scheme of the second revision of the OCZ Rally2 flash drive. The OCZ Rally2 Turbo 4GB, like its predecessors, implements dual channel technology in the flash controller to split and store data on two different flash memory chips to enhance performance (Think dual channel RAM to double the bandwidth, or RAID0 inside the flash drive). The top face of the drive has the Rally2 logo with the "Turbo" behind it; much similar to the font used with the OCZ ATV Turbo flash drive. The back edge is rounded off with translucent plastic to symmetrically correspond to the cap on the other side. Parts of the green PCB can be seen behind the translucent plastic, which at the same time acts as a passthrough for the trademark OCZ Rally series orange LED. The caved in cut in the middle is created aesthetically to correspond with the lanyard on the other side for a complete symmetrical design throughout the OCZ Rally2 Turbo flash drive. Anyways, the USB connector is a full height USB connector with unexposed pins because the OCZ Rally2 Turbo is shaped to accommodate this design. However, retaining much of the original design schemes of the OCZ Rally2 revision 2, the USB connector is not retractable and uses a cap instead. This is strictly up to your preference, but as far as I am concerned they aren't the most convenient and certainly isn't among the latest craze. The cap design, as shown above, has the OCZ logo well implemented on one side. The other side is blank; and as mentioned earlier, to compliment to complete symmetrical design of the OCZ Rally2 Turbo translucent plastic is used to reciprocate the other end. A quick size comparison -- from the left, OCZ Rally2 Turbo 4GB, OCZ Rally2 1GB (First revision), SanDisk Cruzer Titanium U3 2GB, A-DATA N701 4GB, and A-DATA PD-17 1GB. As the OCZ Rally2 Turbo is a performance drive, we certainly did not expect it to be small -- since that's not really the point. The OCZ Rally2 Turbo comes at a reasonable physical size, and its sleek design of sticking to not being much wider or taller than a standard USB connector prevents the drive from interfering with nearby USB ports. We've also attached the long white lanyard to the OCZ Rally2 Turbo. Personally I found this a bit too long for my likings (I don't put the flash drive around my neck, after all) so I ended up taking the one from my original Rally2 and attaching it to the Rally2 Turbo. The OCZ Rally2 Turbo 4GB with its bright orange LED that lights up when plugged in and blinks in accordance to drive activity. In our proprietary APH Multifile real life performance tests, which has proved to be quite a challenge for most flash drives -- usually scoring poorly in this benchmark if it's not that well used to writing 400MB worth of files; with quite a portion of them under 1MB in size. But that's not the case with the OCZ Rally2 Turbo 4GB -- it flew past this test set with flying colors. In our read performance, it finished the test at 22.25 seconds; which translates to a read speed of 17.93MB/s. The second fastest drive in this category is the original Rally2 at 13.29MB/s with the Cruzer Titanium U3 following close at 12.44MB/s. Same goes with our write performance tests. While this performance benchmark is good enough to bring most flash drives down to their knees, again the OCZ Rally 2 Turbo finished it at a record breaking 237.29 seconds -- or 10.7MB/s in multifile write. 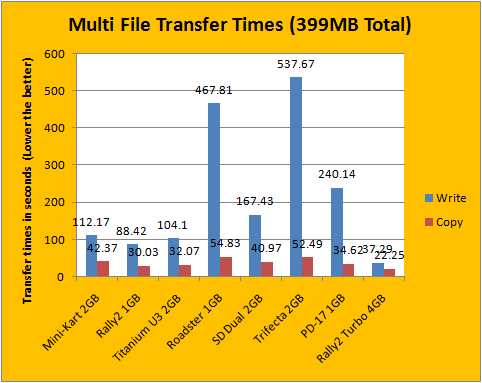 Needless to say, the OCZ Rally2 Turbo 4GB that we've tested left the competition in the dust. Nothing is quite in the class to challenge the performance crown in this category. In our APH proprietary single file benchmark, this test set is used to see the maximum real life potential of the flash drive. Finishing the read portion of this benchmark at 11.91 seconds, this 33.5MB/s read performance is simply the fastest we've seen in any flash drive -- it's quite close to OCZ's advertised speed at 35MB/s read speed. Heck, any faster would probably be limitations of USB2.0. The next closest is the original Rally2 at 21.13MB/s, as shown in the graph above. This is absolutely impressive. In our single file write performance benchmark, the OCZ Rally2 finished the test in 19.3 seconds, translating to a write speed of 20.67MB/s. That's roughly twice as fast as anything else in range -- the former fastest drive in this test is the SanDisk Cruzer Titanium U3 2GB at 11.67MB/s. 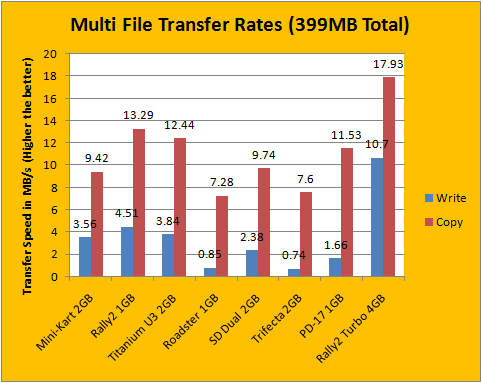 The Rally2 Turbo simply shattered every other flash drive's score. 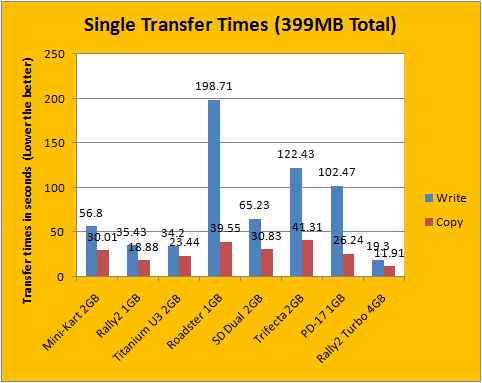 Being that, OCZ advertises the Rally2 Turbo's write speed to be 30MB/s; that's something we can't hit in our tests even with some of the latest hardware. Again, the OCZ Rally2 Turbo is simply the winner in this category -- and it wins not by a hair, but by several miles. In the past, we've complained quite a bit about latency issues with OCZ flash drives. We are delighted to see OCZ addressing this problem for everything they've released in the past year and a half. If the OCZ Rally2 Turbo 4GB's performance crown was hindered by the latency of the drive, that would certainly be a party pooper. 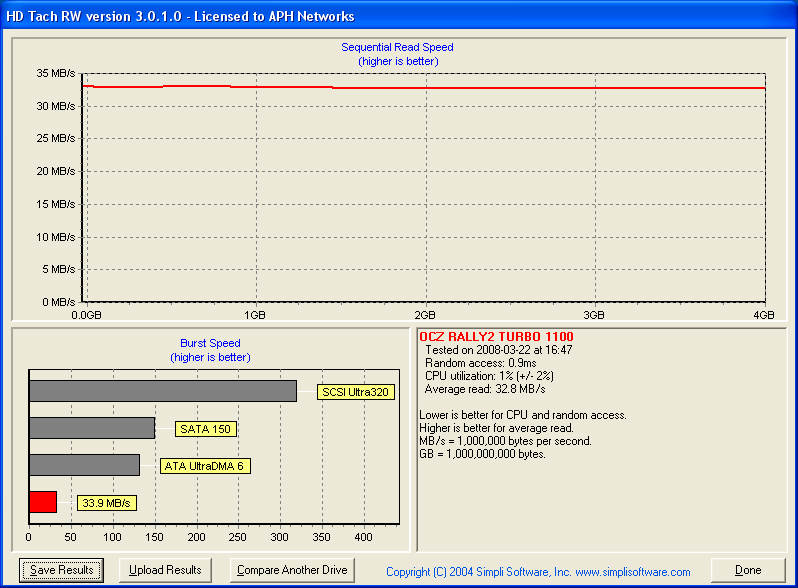 Fortunately, the OCZ Rally2 Turbo 4GB that we've tested takes home the performance crown once more -- at 0.9ms. it's certainly within the acceptable range of 1.0ms latency (Anything below 1.0ms doesn't really matter). Performance across the flash drive is very consistent as well -- our HDTach Full Bench run shows a consistent 32.8MB/s read speed on our Intel ICH9R controlled USB ports, as well as a maximum burst rate 33.9MB/s. The OCZ Rally2 Turbo simply owns. 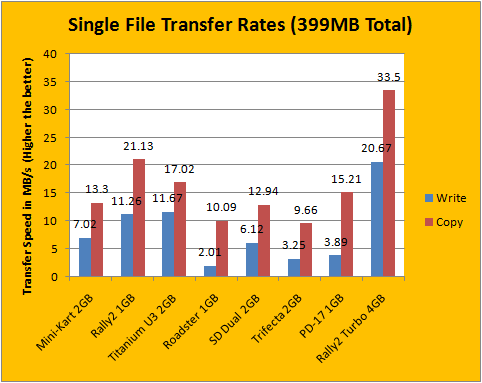 The OCZ Rally2 Turbo 4GB is simply the fastest flash drive we've tested so far here at APH Networks. OCZ has not only made an insanely fast flash drive, but they've also done it right in pretty much every aspect in terms of performance this time. Although the Rally2 Turbo we've tested did not hit that 30MB/s maximum write speed in our performance tests, I have nothing to criticize in its performance area -- in fact, the OCZ Rally2 Turbo 4GB deserves heck a lot of praise for being just that much faster than everyone else. The graphs simply speak for itself. In terms of design, well, the OCZ Rally2 Turbo 4GB is sleek, and its symmetrical design with excellent use of material and color coordination creates a drive that not only looks great, but also feels great (Thanks to its aluminum casing). I feel that the use of a USB connector cap is a bit dated, the included lanyard isn't much to my tastes, and, just to be a picky guy, "the flash drive can be smaller". But really, those are minor complaints -- the OCZ Rally2 Turbo 4GB is really one of the best flash drives in the market today, and its combination of performance, aesthetics, and post-purchase customer support and warranty can't be beat. Anything with an 8.0/10 is rare at APH. But the Rally2 Turbo made it past that mark with more to spare. 9/10 means Excellent product with very minor drawbacks that does not affect the overall product. I don't know man, the OCZ Rally2 Turbo really roxored my boxors. It's the second highest scored product on APH Networks at the time of writing!